Profit Maker Review - Profit Maker is a Scam! Profit Maker Review – Profit Maker is a Scam! Profit Maker found at profitmaker.co promises to make you thousands of dollars for free, but don’t be fooled. Profit Maker is a scam. We’ve collected several evidence in our Profit Maker review, so make sure you read them before committing yourself to a financial headache! How did you come across Profit Maker? Did you receive a shady email promising a money making opportunity, stumbled upon a banner advertisement online, or it simply popped up when you were browsing the web? No matter how you came across it, “business opportunities” that came out of nowhere and promising huge profits IMMEDIATELY are always something to be careful of. The same goes for Profit Maker scam. Right off the bat, you’ll be able to tell the inconsistency of this scam. The headline clearly says to turn $7 into $2,300 every single day FOR LIFE. But as soon as you listen to the sales video, it becomes $1997.50 every single week. So which version is correct? Apparently it’s a poorly thought-out scam. None of these claims are real, because Profit Maker will scam your hard-earned money away and gives nothing back. The headline is just there to capture your attention and make you watch the sales video, which is why they don’t tally at all. Not only that, the people you see withdrawing money from ATM at the beginning of the video are actually actors paid to promote another scam called the Profit Maker Method. Notice how they mention “Profit Maker Method” instead of Profit Maker. After some investigations, it was revealed that Profit Maker Method was actually a discontinued scam. 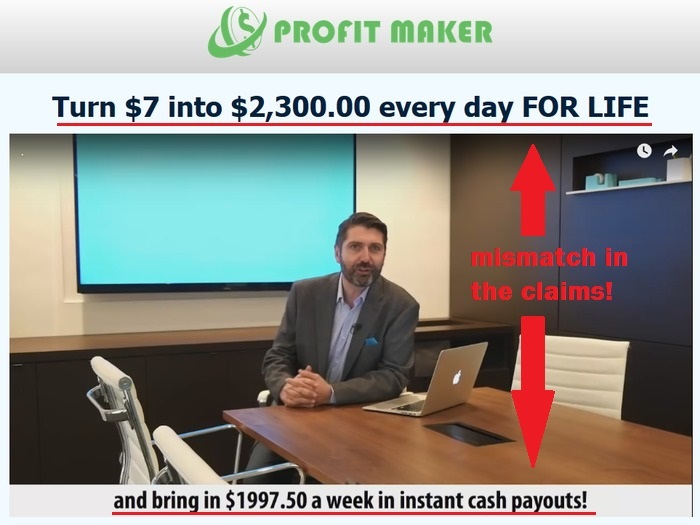 Therefore, Profit Maker scam is actually just a recycled and re-branded Profit Maker Method scam, and they didn’t even bother to tally the promised profits ($2,300 a day vs $1997.50 a week). And of course, all these “profits” are just random numbers used to capture victim’s attention. In reality, you will lose all your deposits in a matter of minutes, just like many other binary trading software scams. There are many more red flags that you should take note of, and we’ll reveal them one by one in the rest of this review. If you scroll down from the sales video, you’ll see several Facebook post that allegedly credit Profit Maker for helping them profit. These posts have certainly added some credibility to Profit Maker scam, since social testimonials are the most powerful, and most authentic way to judge if a product is good. However, it becomes dangerous when these social testimonials are fake. Try clicking on any profile or links within the posts. Try liking the posts, commenting on them, or even sharing them. You’ll realize that nothing can be clicked, and the user profiles lead to nowhere. Why is this happening? These are actually just a wall of texts customized to look like Facebook. None of these posts or profiles are real. If you want to authenticate for yourself, you may try to search for these names on Facebook itself. You won’t find anyone with the names and matching profiles. If you scroll further, you’ll the profits generated by “members” of Profit Maker from all over the world. Again, Profit Maker is trying to prove that their software is really generating huge profits for its members. Of course, we wanted to authenticate the existence of these members, so we ran a reverse lookup of these member profile pictures. What we found was disappointing. Sally Garcia was one of the featured members. However, this member, along with the others, are proven to be fake members. 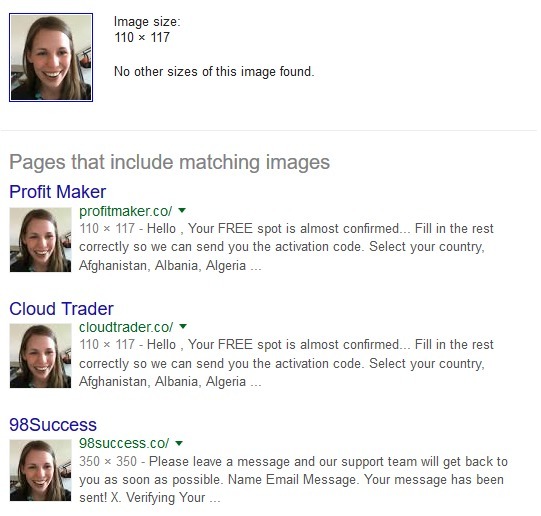 A simple reverse lookup on Sally Garcia’s photo will return results from other scams, such as Cloud Trader scam which we have reviewed before, and another scam called 98Success. Did she really make profits from so many scams? Of course not. The reason this photo is appearing everywhere is because it is a stock photo. Multiple scams are using the same photos to fabricate member profiles, and it can only be found out if you deliberately look for it. These scams are betting on the fact that the vast majority of victims wouldn’t even realize it. We couldn’t access the terms and conditions pages in the official website of Profit Maker scam. The clause shown in the above image can be found at the bottom of their official page at profitmaker.co, but they merely show the name of the page at the footer. If you try to click into the Terms and Conditions and TOS pages, you will simply be redirected to the homepage again. The only possible explanation is because the scammers behind Profit Maker want to develop trust factor without putting in too much effort, just like using fake Facebook posts and fake member profit statements. Once again, they are betting that vast majority of their victims wouldn’t find out the fact that these documents aren’t even available. Most people will be assured upon seeing the fine prints without even clicking into it to read. Is Profit Maker a Scam? YES, PROFIT MAKER IS A SCAM. We strongly advise you to stay away from the scam if you don’t want to lose your hard-earned money.